The Soldier Palmer is an old pattern which still finds favour as a bob fly by boat anglers. 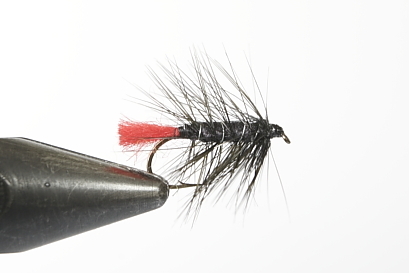 There are three flies of a similar vein which are tied in basically the same way, the others are Grenadier and Zulu. If you can tie one you can tie them all. There is a more recent variant which is popular and that is the Bibio. All are worth a place in your box. Today we will start with the Soldier Palmer which has a palmered hackle. This means that the hackle is tied in at the head and wound down the body as far as the tail. It is secured by the gold wire rib. This makes the fly durable. Tools are simple. Vice, bobbin holder, scissors. Hackle pliers and grannies hat pin. I am confident that you will find this lesson an easy one. P.S. Thanks again for all your comments and I’m very pleased to hear you are all making good progress. hi dave,thanks so much for the easy fly tying instructions.your step by step tutorials are excellent and easy to pick up on.thanks to you i,m back on the water pulling nice fish on the soldier pattern.i dont have a problem doing a whip finish with my fingers and the double half hitch sounds easy.the whip finish tool hasent been used yet.thanks again.cheers. Hi Mr Cammiss, What capes do you recommend for palmering wets? 1st of all I want to say I do njoy your video’s….. In making this fly I did change the color to Red yarn. Thank you and Keep the Video’s coming. Thanks for you comments. We aim to make life easier and share the tips picked up in a lifetime. Jon’s comment was, ‘ I keep on telling you how good I am…..now do you believe me?’ He really does a great job and puts more thought into the photography than a lot of the ‘pros.’ The whole family is a team, unfortunately there is no room in the credits for the Tea Lady. We will do something about that when we do a DVD. Yours is a great site for anyone wanting to tie their own flies. I tied my first fly in1975 and you cleared up a lot of mysteries tonight while I browsed lessons on your site. Also what a wonderful son you have to help get your message out so clearly. I think you are one of the lucky few who went through life and got it righlt. Thank you so much for the excellent website. It is a first class resource for those of us beginning our fly fishing journey. Your relaxed manner, great knowledge and good quality videos have really helped me a lot. Thanks to you and your team. I am a whip finisher by choice (can’t seem to make my fingers do your half hitches). The one video that was finally the key to managing the whip finisher can be seen at . Didn’t have a clue until I saw this. It may be of use to your viewers who are having trouble starting whip finishes. Again many thanks and keep up the fantastic work. Hello David ,I have just watched all your videos and let me say I am very impressed.I am a teacher and I know that simple instructions given in an interesting way are the best.I am a complete novice ( in fact I am waiting for my vice and tying materials to arrive as we speak). I was a little concerned about what to buy in the way of materials but I feel a lot happier now I have seen you construct the majority of the surefire winner flies.Many thanks and keep up the good work. By the way if you can kick a ball you can have my job,I would rather be fishing. The whip finish tool is a mystery to me also. It takes me twice as long to do as the double half hitch and I just cannot be bothered with it. My fishing buddy does a whip finish with his fingers…..makes it look easy but my fingers dont seem able to do it, and he is only 82 years old. Fantastic, keep up the good work! again Well done all…..and thank you……. Nice to hear of your success. We have a couple of clips to go out in the next two weeks. The next shoot we will do the klinkhammer….not really a beginners fly but will come with practice. Get yourself some light buzzer hooks size 10. Kamasan B100 are about the lightest. Thank you so much for your lessons, I’m a “brand new” fly tier and I can’t even being to tell you how much this site helps… Thanks. By the way I love the whole family thing going on the videos. Tell the guys that I really like their takes and music. Thank you David for lesson 8 you make it all seem so simple.I know its not of course but your relaxed style gives people inspiration I hope you continue with the lessons for many more sessions. Many thanks for lesson 8, I am really enjoying your videos, and I’m getting quite a collection of materials together now. My husband uses the zulu quite a lot. Would you be able to show the Klinkhammer at some stage in the near future, that’s a big favourite with him at the moment, and he caught a few fish recently in the lake district on one of the rivers there. A couple of local fisherman had been trying all day without a bite and he bagged several on this fly and only started fishing late afternoon! Thanks again for the best fly tying site on the web! Welcome aboard. Hopefully we will be able to keep you intersted. More patterns on the way. Thank you for the Zulu and greetings from Finland. At the moment you’re my mentor in fly tying. Keep up the good work!